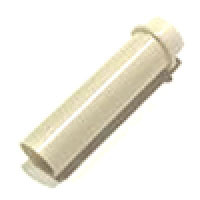 Plastic coil sleeve, 2-11/16 inches (69mm), with flange. For use on devices where coil plunger goes all the way through the coil rather than hitting a coil stop. Replaces Williams # 03-7067-1, Stern # 545-5847-00, Gottlieb # 5142.